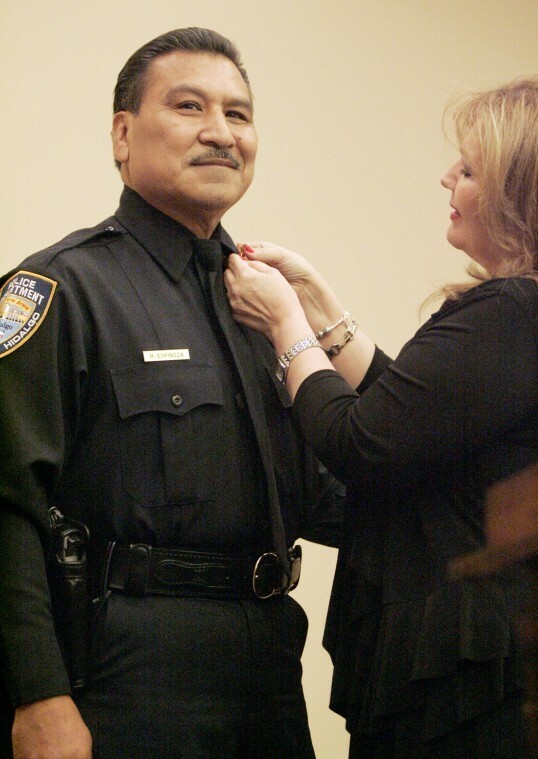 Rodolfo "Rudy" Espinoza is seen receiving his badge from his wife, Esther Espinoza, as the new police chief of Hidalgo during a swearing in ceremony at the Hidalgo Chamber of Commerce Friday Oct. 19, 2012. Hidalgo Police Chief Rudy Espinoza has been suspended, Mayor Pro-Tem Gustavo “Gus” Sanchez confirmed Tuesday. The decision was made in executive session during the Oct. 15 city council meeting, and city personnel attempted to keep the decision under wraps over the past two weeks. After failing to return multiple requests for comment, Hidalgo City Manager Julian Gonzalez, through City Secretary Denise Elliff, told The Monitor on Oct. 23 that he was not ready to comment at the moment, but would call as soon as he knew something, this despite Gonzalez being present at the meeting. City Attorney Ricardo Perez also failed to return multiple calls requesting comment, as did Mayor Sergio Coronado. Espinoza has served as police chief since 2012. An attempt to reach him for comment Tuesday was unsuccessful. The city of Hidalgo has provided no information as to the terms of the suspension. Lt. Jesus Ortega has been named interim police chief, according to a police dispatcher.